The ambassadors of France, Germany and the U.K. delivered a harsh rebuke of the Trump administration's decision to recognize Israeli sovereignty over the Golan Heights at two separate meetings at the White House and State Department yesterday, three European diplomats briefed on the diplomatic démarche told me. Details: After issuing public statements that raised concerns about Trump's decision, the three European ambassadors met at the White House on Tuesday with Victoria Coates, the National Security Council's senior director for the Middle East. They had another meeting at the State Department with David Satterfield, acting assistant secretary for Near Eastern Affairs. European sources told me the meetings were difficult and ended unresolved, with both sides agreeing to disagree. Behind the scenes: The sources said the French, British and German envoys told Coates and Satterfield that Trump's recognition of the Golan was a violation of international law and UN resolutions and that it legitimizes taking over land by force. 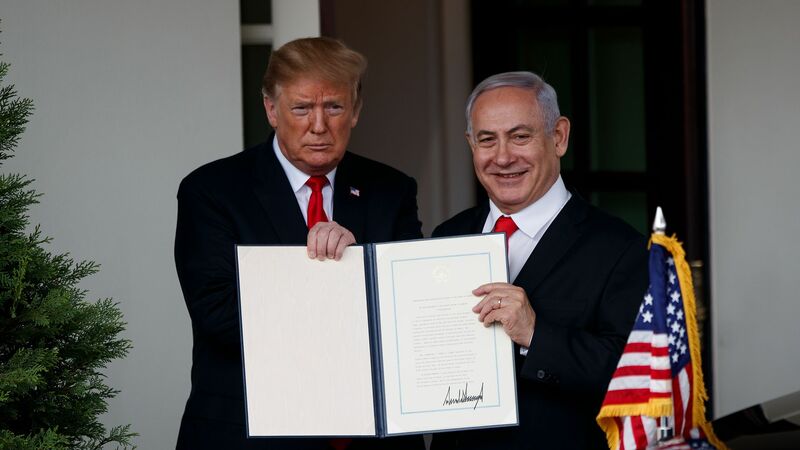 The White House and State Department officials stressed that Trump's move was necessary for Israel's security, due to Iranian entrenchment in Syria. They said that the peace process between Israel and Syria has been frozen for years and that Israel will never pull out of the Golan Heights for security reasons. It was time to recognize reality, the U.S. officials said. The three ambassadors asked for clarifications regarding the Trump administration's position on the work of UNDOF, the peacekeeping team of UN observers in the Golan. The U.S. was the one who pushed the resolution that founded the UN force together with Russia in 1974. That stated that the Golan was a Syrian occupied territory. According to the European diplomats, Coates and Satterfield said the Trump administration was satisfied with UNDOF and wanted it to continue its work in the Golan despite Trump's decision. They added that Israel held the same view. The big picture: The three European ambassadors told the White House and State Department officials that Trump's move could legitimize the Russian annexation of Crimea. The U.S. officials answered that the Golan and Crimea were totally different cases. They said the Golan was captured by Israel during a war that was forced upon it, while Russia was not in a state of war with Ukraine when it invaded and annexed Crimea in 2014. The European Union on Wednesday issued a statement saying it was the unanimous position of all 28 member states not to recognize Israeli sovereignty over the Golan Heights. The State Department and the White House did not provide comment.